What’s an end? A freeze? How deep do you have to dig to “bury a stone?” Like any other sport, curling comes with its own unique vocabulary. Check out our glossary so you can talk the talk too. Backboards: The boards behind the back at either end of the playing area. Blank End: An end that is scoreless. Burying a Stone: Placing a shot behind a guard so no part of the rock shows from other end. Button: The innermost circle surrounding the tee. The button is usually one foot in diameter. Center Line: A line drawn from one hack to the other, passing through the tee at both ends of the ice. Come Around: A shot that curls around a guard. Coming Home: Playing the final end of a game. Counter: A stone that is in a scoring position. Curl: The rotating movement of a stone caused by turning the handle. Delivery: The act of throwing a rock. Double: Removing two stones from play with one shot. Draw: Although a draw is normally into the house, any rock where the speed will make it stop between hog line and back line. Eight-ender: An end in which a team has scored the maximum possible number of points. Eight end games are rarer than a 300 game in bowling. In Potomac's 58 year history we have had six 8-end games. End: A division of the game. An end is complete when all sixteen rocks (eight per team) have been thrown. A club game is usually eight ends, or about two hours long. Extra End: An additional end played to break a tie at the end of regulation play. Freeze: A draw that finishes touching or nearly touching another rock. Front End: The lead and second player on a curling team. Guard: A rock between the hog line and the house that can be used to protect rocks in the house. Hack: The rubber starting block embedded in the ice from which the curler begins deliver of a stone. Hammer: The last rock in an end. Heavy: A stone that is delivered with more than the desired amount of weight or force. Heavy Ice: Opposite of fast or keen ice. Heavy ice requires a stone to be thrown with more than normal weight. Hit: A rock intended to collide with another rock. Hit and Roll: A takeout that removes a stone, hitting it off center and then moving to a target area. Hit the Broom: When a curler releases his rock directly on the skip’s target broom. Hog: A stone that stops short of the far hog line. Hog Line: A line located 21 feet from each tee. A rock must be released before the near hog line, and travel beyond the far hog line. House: The round scoring area, 12 feet in diameter, with concentric circles 1, 4, and 8 feet in diameter. Hurry: A call used by some teams to tell the sweepers to sweep quickly. In-turn: A rock whose handle is rotated inward toward the body. An in-turn for a right-handed curler rotates clockwise. Keen Ice: When little effort is required to deliver the rock. Also known as fast ice. Last Rock: The last rock to be thrown in an end. Lead: The player who delivers the rink’s first two rocks of each end. Lie Shot: Having the stone closest to the tee. Light: A stone that is delivered with less than the desired weight or force. Long Guard: A guard near the hog line. Lose Handle: A stone that loses its initial rotating motion during its travel down the rink. Narrow: A rock delivered inside the intended line of delivery (between the skip’s broom and the target). Off the Broom: A stone that is not delivered on the line of the skip’s broom. On the Broom: A shot that started out on a line toward the skip’s broom. Out-turn: A rock whose handle is rotated outward or away from the body. An outturn for a right-handed curler rotates counter-clockwise. Pebble: A light spray of water that freezes on contact with the ice creating small bumps that cut down the amount of the ice surface the rock is in contact with. Port: An opening between two or more rocks that is wide enough to allow a stone to pass through. Raise: The action of promoting a stone from one position to another closer to or in the house. Rings: The circles that make up the house. Rink: A curling team that consists of four players: the skip, third (vice-skip), second, and lead. Also refers to the place where curling is played. Roll: The movement of a stone after it hits another stone off center. Second: The player who delivers the team’s third and fourth rocks. Second Shot: The stone that is second-nearest to the tee. Sheet: The 146-foot-long area of the ice on which the game is played. Shot: The stone that is nearest the tee during the play of an end (also known as shot rock). It may also refer to the playing of a stone (i.e., making a shot). Shot Rock: The rock that is closest to the tee. Skip: The player who calls the ice and determines the strategy. Almost always plays the last two rocks for his team (but may throw in a different order in some games. Slide: The part of the delivery after the curler leaves the hack and moves down the ice completing the throwing of the stone. Slider: A slippery device that is worn on the sliding foot during the delivery of a stone. Usually teflon,plastic or stainless steel. Steal: What happens when the team that does not have last rock scores a point or points. Sweeping: Using a brush to polish the ice in an effort to alter the action of the rock. Takeout: A type of shot that removes another rock from play. Tee: The center point of the house. Tee Line: A line passing through the tee at right angles to the center line. Third: The player who delivers the team’s fifth an sixth rocks and assists the skip in strategy and ice reading. Weight: The amount of force applied to a rock to move it down the ice. Often called by sweepers usinga numeric system to represent the stone’s final stopping point. Wide: A stone that is delivered outside the line of the skip’s brush. If you’ve watched any curling on TV you’ve probably heard the players saying numbers after the stones are released and you’ve probably wondered what those numbers mean. 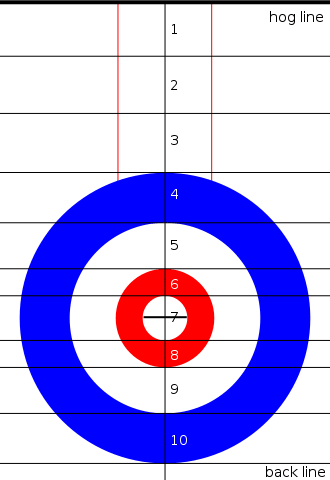 Diagram that shows the number weight calling system as it relates to the ice surface. The tee line has been contained within the button to avoid confusion. During a game, sweepers might call out numbers. These numbers indicate how far the sweepers think the rock in play will travel. This system is relatively new to the game and is often attributed to the Randy Ferbey rink since they were the first major team to use the system, but it is not known whose idea it originally was. 8 to 10 the rings behind the tee line. Sometimes, 11 is used to indicate a stone thrown so that it passes through the house and out of play. With this system, the sweepers can communicate more effectively where they think the stone will end.